When construction crews restricted lanes for cyclists and pedestrians on San Francisco’s famous Golden Gate Bridge last month, representatives of the bridge’s 6,000 monthly cyclists and 10,000 monthly pedestrians expressed safety concerns. Fortunately, bridge representatives responded by creating new temporary lanes, and despite disputes sparked between pedestrians and cyclists, no one was hurt. And to the delight of San Francisco cyclists, bike lanes are returning in full force this weekend. Of course, this news isn’t rosy for all of the Bay’s street lovers, mainly pedestrians. While the bridge’s western bike lane will open, the eastern sidewalk will close, meaning pedestrians will not be able to cross the bridge for months. “Visitors will likely be a tad confused with the partial closure of the east sidewalk as they realize that they cannot walk all the way across the span,” said bridge spokeswoman Mary Currie. This marks the newest phase of a $661 million seismic retrofit project intended to ensure that the Golden Gate Bridge can survive an 8.3 magnitude earthquake. The majority of the bridge is ten feet wide, but it gets as slim as 5.5 feet, which explains why cyclists and pedestrians can’t simply share one sidewalk while the other is updated. The retrofit project’s planned completion is 2016, but opening the western sidewalk a month early is a good sign that they’re a bit ahead of the process, or at least not too far behind. 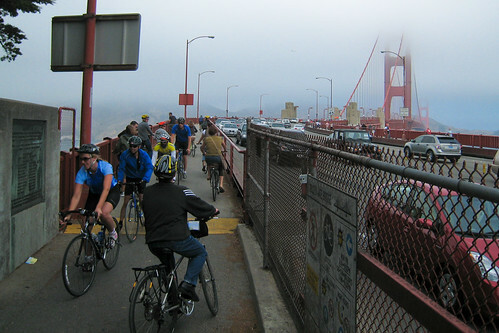 In the mean time, San Francisco cyclists will continue to enjoy the iconic bridge. Next up is to finish construction on the eastern sidewalk so that pedestrians can once again walk across the Golden Gate Bridge safely.